No one to play with - So many kids are in daycare/aftercare until suppertime. You look up and down your street and there are no kids to be seen, much less biking around the streets. The middle and high schoolers in my area don't come off the bus to close to 5 pm, so the older kids that might watch out for younger ones aren't around in the afternoon. Fortunately, my kids have a lot of siblings, but still, it's pretty lame to be told to go play outside on a barren lawn with no one to play pretend with. 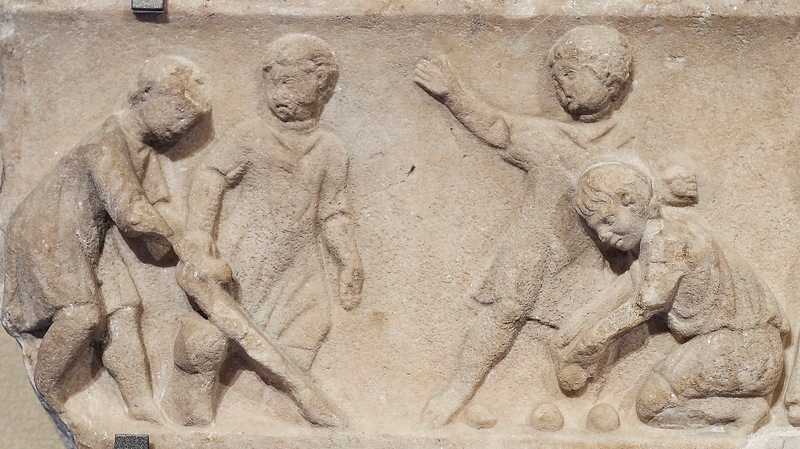 Children playing ball games, detail. Marble, Roman artwork of the second quarter of the 2nd century AD. Via Wikipedia, Creative Commons License. Busybodies/Helicopter Parents - You can't trust that one of your neighbors won't rat you out to CPS if they think your kid is playing dangerously, too far from home, or has no "adult supervision". This could create a nightmare for you and part of this is what drives the "helicopter parent" dynamic. The accusation that you are not "watching" your child translates to you not being a good parent and to protect yourself, you just keep them indoors away from potential criticism. Of course other factors that create the helicopter parent phenomenon are people having fewer kids later in life and treating the children like projects instead of people. Human beings need to practice independence to become confident and mentally healthy, but that's another post. Extracurricular Activities- In a "chicken-or-the-egg" scenario, parents now put their kids in structured activities to socialize instead of letting them play freely in their neighborhoods. Instead of playing stick-ball in the street with neighborhood kids, they have soccer practice after school, dance lessons, gymnastics, etc. The free fun of playing with kids of all ages in the street is no longer available in many areas. The skills of negotiation and cooperation that you learn in a multi-age group of kids does not exist in an adult-mediated setting. In those paid activities, an adult is always there to make sure that everything goes as planned and wraps up in the time allotted. It is not the same at all as free play. Therefore, these kids are growing up around kids, but not knowing how to independently interact with people without an authority figure directing all activity. No wonder these kids will embrace authoritarianism in college! Outrageously High Insurance Co-pays - another factor that plays into the helicoptering, is the fact that if your kid falls out of a tree and breaks their arm, you might be on the hook for $5000 bucks or the full price of the x-rays, and casts, etc. Accidents can be a tremendous financial hit for a family that robs them of all their disposable income. These co-pays are so out of whack for what the average income is, the fear is not just "little precious" will hurt themselves, the fear is also that the savings account will be wiped out. Fortunately, for me, my family size gets me a great deal at the hospital should I need it. PedoGate - Let me preface this by saying that kid-snatching is in fact, very rare, but the mere possibility is so terrifying, that many parents just can't deal with having their kids out of their sight. Often quoted is the millions of missing kids statistics. But realize that every time a foster kid runs away from home, as they are wont to do, the foster parent is required to report them as missing. Some foster kids may try to run away more than once a day, and that is definitely skewing the statistics. Also, a relative or parent might take off with a kids and often, the Amber Alert is a parent in a custody battle saying screw it, they're mine. When it comes to family stuff, who knows what's really going on? The statistic we want is the random snatching per capita one. There was one study done 20 years ago that states that only 115 "stereotypical abductions" happen every year, defined as a stranger wanting a ransom. But there are about 58,000 non-family abductions per year that include being lured away by someone the child already knows. The type of abduction that is most terrifying is the one by a stranger that doesn't ask for a ransom and leaves your kid raped, murdered and face down in a gutter. Getting statistics that speak to the actual thing to be afraid of is difficult. That being said, I've noticed on the Missing Children map that Alexandria, VA is one place I'd watch my kids pretty closely. To summarize, parents start hearing the theme music from Unsolved Mysteries when letting their kids out to play and don't let them outside for hours of uninterrupted fun, because of the actual boogie-man. So when you try to compare growing up thirty or more years ago to today, please remember none of these factors were in play then. When you complain that kids just play computer games, remember that they do no have much support or incentive to be out and about doing outdoor things. Their parents and community do not support them running through their neighborhoods playing. I can guarantee that neighbors would complain and call the cops on a band of kids doing little rascals type stuff and then complain about it on Facebook or Nextdoor, trying to shame the parents. The old biddies that would give you a hard time about your kid playing video games are the first ones that would call CPS on you for them playing past their yard. It's a very strange and artificial situation. It is not a good thing. I agree, that's whey the Bible calls the law "pedagogos". In Greece, pedophiles were such a problem families had to hire a trusted man to walk their boy to school to keep him from getting sodomized. The random pedo is not as frightening trafficking rings that are described in the "Conspiracy of Silence" documentary. National news does indeed change people's perceptions of reality!